I meet Emma outside the Linden centre after she drops Aiden off at nursery. She has Ciaran in the pram. I have both kids with me and it’s a bit of a slow start as Ernest doesn’t want to sit in the pram, he wants to scoot and run about. Emma says her usual walks are errand running ones around the town so that’s what we start out with – post office and then pharmacy. Ernest scoots and walks for a bit, and we meander after/in front of him. After a little while I bribe him into the pram with the promise of a treat when we get to the first shop. As we walk we talk (in snippets to begin with, as I am chasing Ernest) about the Wee Toots group that Emma has just given up chairing. The group used to be council funded until around 3 years ago, when cuts were threatening to close the Linden Community Centre where they are based. A group of parents managed to negotiate to keep the centre open, and took on the running of the group – a drop in for parents and babies/toddlers a creche, and a messy play session. It wasn’t for a year or so that Emma got involved, unfortunately some financial issues were facing the group and it took a lot of work to get things back on track, getting the accounts in order and making sure that new policies and procedures were in place to safeguard the group. We talk about our prams (which are made by the same company) and how good they are. They’re expensive but we agree worth it, as they pretty much push themselves. 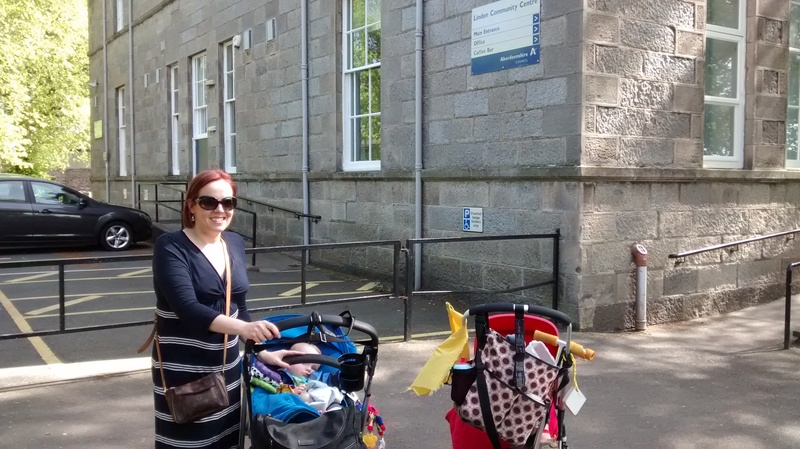 We talk about which shops you can get a pram in – and head for the pharmacy which has an automatic door. When they took over at Wee Toots Emma and Joanne and the new committee put together a successful funding bid to the national lottery, and they’ve just finished spending the £10,000 that they were awarded. Emma is relieved to be handing over the committee work as she is expecting another baby, and is about to move house. As we walk we also talk about the pleasures and pitfalls of walking in Huntly. Emma’s experience echoes what Teresa told me yesterday, that Huntly is just the right size to be walkable – and has everything that you need day to day to make that possible as well. But there are problems too. There are lots of streets that don’t have pavements at all, or where the pavement is very narrow, or runs out part way along. We talk about Deveron Road – the main route to Tesco, which has a terrible bit of pavement outside the garage that narrows down almost to a point, and there are often cars parked on it so it’s impossible to get around safely – you have to just go into the road. Finishing the errands we walk down Duke Street and turn to go and see the new house that Emma is about to move into. It’s beautiful. She chooses a route for us with reasonably wide pavements, and we can walk next to each other most of the way. We talk about the heyday of Huntly, when the streets were busy with shoppers. We talk about health visitors, and whether they are trusted (or ignored, or resented) and whether a new generation will come through soon that might be better able to connect with younger mums. We talk about the maternity units at Inverness and Aberdeen, and how far they are to travel to from Huntly: there are lots of unplanned home births. We talk about the oil and gas industries and working away from home; we talk about gendered industries and pay, and lifestyles and income disparity. We talk about commuting, and going back to work after having children; maternal guilt; disruption to children’s routines. Ernest falls asleep. It’s very early in the day, but he’s not been sleeping all that well, and he had a busy day with the childminder yesterday. We talk about nurseries and childminders and sleep. We talk about the economic and social value of the work that the Wee Toots committee do, and how lucky Huntly is to have their commitment and expertise. We talk about the workload of the paid community workers, and the areas that they have to cover, and how difficult it must be to try to keep up with everything. We loop back around to make our walk nearly circular, finishing back by the Linden Centre. We talk about which day would be best to try and organise the perambulator parade on, and times, and how to get people involved. Ernest is still sleeping so I head to the office to try to start writing this before he wakes up.